Rising star Harry Nilsson, Sunset Strip, 1969. Harry Nilsson has a musical resume which qualifies him to join the venerated contingent of talent that has been honored by induction into the Rock and Roll Hall of Fame. Though somewhat unknown in his early career, Nilsson quickly emerged as one of the most diversely talented and influential singer-song writers of the 20th century. His dynamic song book crosses the panorama of rock, pop, country and blues, and many of his songs have been famously covered by other noted performers. Throughout his career, Nilsson has been recognized for his interpretations of other artists’ songs with astounding renditions that awarded him two Grammys at the height of his popularity. Close examination of Harry Nilsson’s career reveals a brilliant artist whose musical contributions and ongoing influence seem to check the boxes on the list of requirements for entry to the Rock and Roll Hall of Fame. He has the musical stature to stand with the best of them and it is time for the Rock and Roll Hall of Fame Foundation to honor this magnificent artist. Apple Corps press conference, May 14th, 1968, NYC. Widely considered the best singer of his time, Nilsson set the bar with his gymnastic, three-octave range and seemingly otherworldly vocal control. He was an early pioneer in the practice of an artist dubbing his own background vocals and his intricate, multi-layered vocal arrangements remain influential today. Over his career he achieved eight top-40 singles and was awarded two Grammys for his covers of “Everybody’s Talkin’” in 1970 and the stunningly beautiful “Without You” 1973. The Monkees’ Mike Nesmith contemplating Nilsson’s album “Pandemonium Shadow Show”. The Monkees’ recording of “Cuddly Toy” in 1967, one of the group’s biggest hits, was the catalyst that led to a succession of other artists performing songs written by Nilsson. He was covered by a “who’s who” of the eras biggest names, such as Rock and Roll Hall of Famers The Supremes, The Ronettes, Neil Diamond, Rick Nelson, Herb Alpert, Brian Wilson, Jack Bruce, Lavern Baker and The Yardbirds. Other notables also covered his songs including Ella Fitzgerald, The Turtles, Astrud Gilberto, Dave Brubeck and Link Wray. and Nilsson’s “One” was a top 5 single for Three Dog Night. As Nilsson’s reputation grew, he became highly sought after as a collaborator. Among the many artists who respected his talent and pursued working with him are Hall of Famers Phil Spector, John Lennon, Ringo Starr, Randy Newman, Keith Moon, and Dr. John, The creative synergies of these gifted artists resulted in many recordings which achieved critical and commercial success. For the Love of Harry: Everybody Sings Nilsson, 1995. Though Nilsson sadly left us in 1994, his shadow continues to loom large on the music world today. His songs have been covered in recent years by artists as diverse as Neko Case, LCD Soundsytem, Aimee Mann, The Eels, Shooter Jennings, Jellyfish, Shonen Knife and Macy Gray. New York indie rockers The Walkmen covered Nilsson’s entire Pussycats album (legendary among rock music fans for its central part in the well-publicized John Lennon/Harry Nilsson “Lost Weekend”). Nilsson’s records have been sampled by hip-hop artists such as Cypress Hill, PM Dawn, Jurassic 5 and Blackalicious, who based the title song of their Blazing Arrow album on Nilsson’s “Me and My Arrow.” Younger artists are discovering him as well. In interviews he is regularly cited as an influence by up-and-comers like Michael Kiwanuka and Tobias Jesso Jr., and singer-songwriter Luke Saxton released a song simply titled “Song for Harry Nilsson.” To date, three tribute albums have been released in his honor, the most recent being 2014’s This is the Town, featuring 20 indie-rock bands performing his compositions. Nilsson’s creative endeavors in film included composing the musical scores for Otto Preminger‘s Skidoo and Robert Altman’s Popeye, and he contributed music to John Schlesinger’s Midnight Cowboy in addition to singing the movie’s theme song. He ventured into the genre of animated films by co-writing and scoring the made-for-television children’s fable, The Point, for which the accompanying soundtrack included the hit song “Me and My Arrow.” Film makers such as Martin Scorsese, Terry Gilliam, Nora Ephron, Noah Baumbach, Stephen Frears, Paul Thomas Anderson and Quentin Tarantino wisely selected Nilsson’s songs to fully engage their viewing audiences. From the jolting, jarring “Jump Into the Fire” in GoodFellas to the poignantly sentimental “Remember” in You’ve Got Mail, the emotional intensity demanded by Nilsson’s songs makes it easy to understand why they are frequently featured as the star of a scene and not merely as innocuous background filler. Oblio and Arrow from the animated film “The Point”, 1971. His album The Point, and the animated film, established him as one of the earliest artists to experiment with children’s media. A Little Touch of Schmilsson in the Night was among the earliest attempts by a rock artist to record an album of seasoned standards. He was the first remix artist, combining his first two albums and remixing the tunes into a third. He was the first major artist to establish a successful career without ever playing to a live audience. In addition to his many artistic accomplishments, Nilsson’s artistic iconoclasm and hard-partying lifestyle are legendary and have become an indelible part of rock’s iconography. More than 20 years after his passing, Nilsson continues to be heard today through a variety of platforms including feature films, television, animated cartoons and staged theater productions. His work sparks inspiration among the rising set of new artists who favor his unique musical brand. With his timeless and far reaching global appeal, there is little doubt that Nilsson will continue to serve as a major influence in the rock and roll continuum. The hall is not complete w/o his Harryness. the greatest voice of the second half of the 20Th century. The R&R Hall is a sham with out Harry Nilsson! The Hall of Fame? 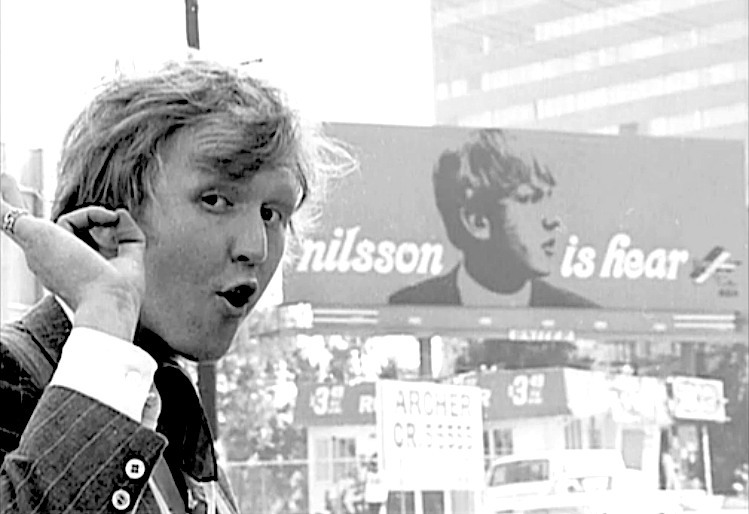 Harry Nilsson should be in the “Auditorium Of Fame”. A hall is something you go down and to the left to find the restroom. Harry deserves much more than just the hall. I am glad Harry Nilsson is in my heart. How could he not be? I grew up with his music on the stereo, back in the days of vinyl albums and album covers. Don’t go breaking my heart! Let’s get Harry in the Hall. If not for the love of Harry’s music, then for the love of his family, friends and fans. His influence was deep and long lasting; influence still felt today. That voice, that voice. The otherworldly beauty of that voice.